Google’s unification of Google+ and search has everyone in an uproar. In simplest terms, when you search for information on Google while you’re signed in on Google+, the results will include results from your circles as well as the normal search-engine results page. Here’s an example. 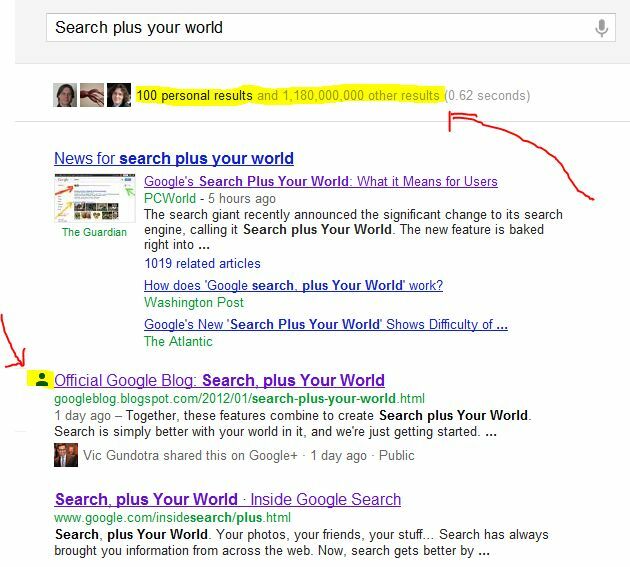 The first red arrow points out the notification of “personal results.” The second is aimed at the icon which will appear next to all G+ results. Immediately underneath, you can see the first standard result for comparison. Basically, anything pertinent to your search that appears either publicly or in circles that have been shared with you will now show up on your results page. On the surface, it looks like a very skewed digital landscape, after all, both the search and the Google+ social platform are Google properties. Closer examination shows that the two largest social networks had effectively opted out a long time ago. Facebook and Google have had a very adversarial relationship over the past year or two, and, as a result, Facebook has blocked Google from accessing most of its data. Zuckerberg and Co. have since cultivated an extensive relationship with Microsoft’s Bing. I think those words would have more sting if Twitter had not removed itself from Google search six months ago. It doesn’t really have much of a leg to stand on, having effectively walled the search giant off from indexing its content. Ian Paul of PCWorld brings up the next big topic of discussion: Will this trigger any anti-trust action out of Washington? Perhaps a bigger issue than any potential sniping from other social networks is that, as bloggers such as MG Siegler and Search Engine Land’s Danny Sullivan have mentioned, Google may get into antitrust trouble over Search plus Your World. Google is effectively using its popularity as a search engine provider to promote its social network by prioritizing Google+ data. Bundling one smaller service on the back of another much bigger one is what sparked Microsoft’s trouble with antitrust regulators through the late 1990s and early 2000s when it included Internet Explorer with Windows. I find it hard to believe that no one at the Google headquarters would have considered the possible invocation of the Sherman Anti-Trust Act. It is distinctly possible that they are playing a longer game. Eldin’s take on things seems quite plausible. Facebook has been a thorn in Google’s corporate side for some time now, effectively walling off huge swaths of the Internet. Since it’s already in the hot seat as far as the FCC is concerned, this sort of approach could really turn up the heat. The fact that IPO rumors abound simply sweetens the deal, as potential investors could well shy away. All in all, the virtual ground has just shifted. A lot. Those of us who work with SEO will be having many sleepless nights while we examine the impact of these changes and how best to move forward. Image by Loki, created for this report.